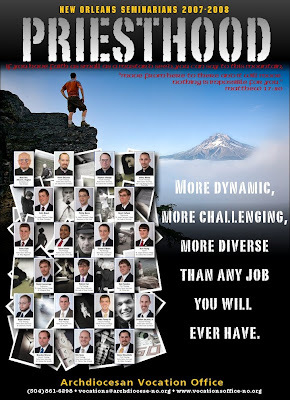 Last night I was looking at some of the posters for Louisiana Seminarians for this year. I was curious as to who entered the minor seminary this past year. I started noticing a trend on the 'these are our seminarians' posters that each diocese puts out yearly. In short, most of them sucked. I found many to be poorly and very plainly designed. From a theological point of view, I found some to be effeminate and uninspiring. I'm sorry, man lace just doesn't make an 18 or a 27 year old guy, or for that matter most guys, say "YEAH! LACE! I'm gonna enter the seminary!" -- if lace has this effect upon a guy then he might have deep rooted psychological problem that requires medical attention. So, I was curious as to if I could make a better poster. Here are the almost completed results. I used mass amounts of photo shop and didn't have images of the seminarians except what I found on the original poster, which wasn't that big. I also got very lazy with the font and text placement, as it was the last thing that I did. Please, let me know what you think. Click on the image for a larger view. I used the NOLA poster because well, I'm from there. Also, I collected many of the background images from Flickr. I do not remember if they were part of the CCL. So if I am using one of your pictures and you don't want me using it please let me know. I do not have a copy of this poster that is large enough to print, so it will never go into production. It is just an experiment and challenge for myself to see if I could do better than the other guy. Now THAT's an advertisement! That's awesome! I agree with you completely, that to have more men consider a calling to the preisthood, you have to appeal to them as *men*. I like it...it is kind of achievement oriented though. I approve of you general idea though--what inspires courage and devotion in these posters? That's what you want to appeal to, right?